Features an array of technical and graphical enhancements for a more realistic Los Angeles. A dark and violent crime thriller set against the backdrop of 1940s Los AngelesAmid the post-war boom of Hollywood's Golden Age, Cole Phelps, an LAPD detective is thrown headfirst into a city drowning in its own success. Corruption is rampant, the drug trade is exploding, and murder rates are at an all-time high. In his fight to climb the ranks and do what's right, Phelps must unravel the truth behind a string of arson attacks, racketeering conspiracies and brutal murders, battling the L.A. underworld and even members of his own department to uncover a secret that could shake the city to its rotten core.Utilizing revolutionary facial animation technology that captures every nuance of an actor's facial performance in astonishing detail, L.A. Noire blends the breathtaking action with true detective work for an unprecedented interactive experience. 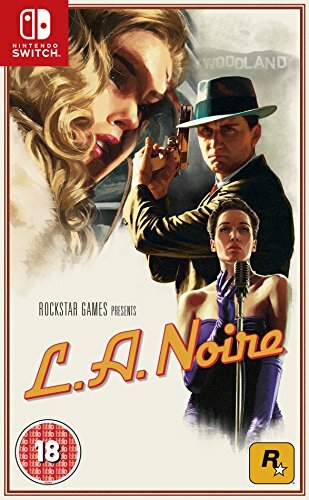 Solve brutal crimes, plots and conspiracies inspired by real crimes from 1947 Los Angeles, one of the most corrupt and violent times in L.A. history Search for clues, chase down suspects and interrogate witnesses as you struggle to find the truth in a city where everyone has something to hide. Digital download of at least 14 GB required to play. Download files to either the Nintendo Switch consoles internal storage or a microSD card (sold separately). Download requirements may change, If using a microSD card, minimum 60 MB/sec read speed required.